For the 1972 film, see Man of La Mancha (film). The principal song, "The Impossible Dream", became a standard. The musical has played in many other countries around the world, with productions in Dutch, French (translation by Jacques Brel), German, Hebrew, Irish, Japanese, Korean, Bengali, Gujarati, Uzbek, Bulgarian, Hungarian, Serbian, Slovenian, Swahili, Finnish, Ukrainian and nine distinctly different dialects of the Spanish language. 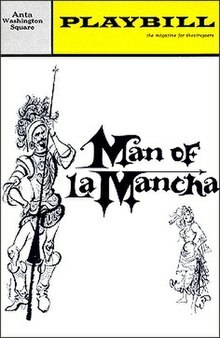 Man of La Mancha was first performed at the Goodspeed Opera House in East Haddam, Connecticut in 1965 and had its New York premiere on the thrust stage of the ANTA Washington Square Theatre in 1965. Man of La Mancha started as a non-musical teleplay written by Dale Wasserman for CBS's DuPont Show of the Month program. This original telecast starred Lee J. Cobb, Colleen Dewhurst (who replaced Viveca Lindfors), and Eli Wallach and was performed on a television sound stage. The DuPont Corporation disliked the title Man of La Mancha, thinking that its viewing audience would not know what La Mancha actually meant, so a new title, I, Don Quixote, was chosen. The play was broadcast live on November 9, 1959, with an estimated audience of 20 million. The New York Public Library at Lincoln Center, Billy Rose Collection, has a rare tape of this broadcast. Wasserman has left us "A Diary of I, Don Quixote" telling the teleplay's history; he himself was unaware that there was any surviving recording. Years after this television broadcast and after the original teleplay had been unsuccessfully optioned as a non-musical Broadway play, director Albert Marre called Wasserman and suggested that he turn his play into a musical. Mitch Leigh was selected as composer, with orchestrations by Carlyle W. Hall. Unusually for the time, this show was scored for an orchestra with no violins or other traditional orchestral stringed instruments apart from a double bass, instead making heavier use of brass, woodwinds, percussion and utilizing flamenco guitars as the only stringed instruments of any sort. The original lyricist of the musical was poet W. H. Auden, but his lyrics were discarded, some of them considered too overtly satiric and biting, attacking the bourgeois audience at times. Auden's lyrics were replaced by those of Joe Darion. The musical first played at the Goodspeed Opera House in Connecticut in 1965. Rex Harrison was to be the original star of this production, but although Harrison had starred in a musical role in the stage and film versions of My Fair Lady, the musical demands of the role of Don Quixote were too heavy for him. After 22 previews, the musical opened Off-Broadway at the experimental thrust-stage ANTA Washington Square Theatre in Greenwich Village on November 22, 1965. The show moved to Broadway to the Martin Beck Theatre on March 20, 1968, then to the Eden Theatre on March 3, 1971, and finally to the Mark Hellinger Theatre on May 26, 1971 for its last month, a total original Broadway run of 2,328 performances. Musical staging and direction were by Albert Marre, choreography was by Jack Cole, and Howard Bay was the scenic and lighting designer, with costumes by Bay and Patton Campbell. Richard Kiley won a Tony Award for his performance as Cervantes/Quixote in the original production, and it made Kiley a bona fide Broadway star. Kiley was replaced in the original Broadway run by first Jose Ferrer on Broadway and in the 1966 National Tour, and then by operatic baritone David Atkinson. Atkinson also performed Cervantes/Quixote in the 1968 National Tour and for all of the matinee performances in the 1972 Broadway revival, which also starred Kiley. The original cast also included Irving Jacobson (Sancho), Ray Middleton (Innkeeper), Robert Rounseville (The Padre), and Joan Diener (Aldonza). John Cullum, Hal Holbrook, and Lloyd Bridges also played Cervantes and Don Quixote during the run of the production. Keith Andes also played the role. The original West End London production was at the Piccadilly Theatre, opening on April 24, 1968 and running for 253 performances. Keith Michell starred, with Joan Diener reprising her original role and Bernard Spear as Sancho. 1992 – with Raúl Juliá as Cervantes/Quixote and Sheena Easton as Aldonza/Dulcinea, running for 108 performances. Easton was replaced late in the run by Joan Diener. 2002 – with Brian Stokes Mitchell as Cervantes/Quixote, Mary Elizabeth Mastrantonio as Aldonza/Dulcinea, and Ernie Sabella as Sancho Panza, running for 304 performances; Marin Mazzie took over as Aldonza (Dulcinea) on July 1, 2003. This production featured Scenic and Costume Design by Paul Brown, Lighting Design by Paul Gallo, Sound design by Tony Meola and Projection design by Elaine J. McCarthy. In the film Man of La Mancha (1972), the title role went to Peter O'Toole (singing voice dubbed by Simon Gilbert), James Coco was Sancho, and Sophia Loren was Aldonza. Hal Linden played Quixote in the show's 1988 U.S. National tour, and Robert Goulet played Quixote in the 1997–98 U.S. National tour. A studio-made recording of the score was released in 1996, conducted by Paul Gemignani and starring Plácido Domingo as Quixote, Mandy Patinkin as Sancho, Julia Migenes as Aldonza, Jerry Hadley as the Priest and Samuel Ramey as the Innkeeper. In 2014, Man of La Mancha featured as part of the Stratford Festival in Stratford, Ontario, Canada. The Shakespeare Theatre Company produced Man of La Mancha as part of their 2014-2015 season. The production starred Anthony Warlow as Quixote and Amber Iman as Aldonza/Dulcinea. In the late sixteenth century, failed author-soldier-actor and tax collector Miguel de Cervantes has been thrown into a dungeon by the Spanish Inquisition, along with his manservant. They have been charged with foreclosing on a monastery. Their fellow prisoners attack them, eager to steal the contents of the large trunk Cervantes has brought with him. However, a sympathetic criminal known as "the Governor" suggests setting up a mock trial instead. Only if Cervantes is found guilty will he have to hand over his possessions. A cynical prisoner, known as "the Duke," charges Cervantes with being an idealist and a bad poet. Cervantes pleads guilty, but then asks if he may offer a defense, in the form of a play, acted out by him and all the prisoners. The "Governor" agrees. Quixote is back at home, and has fallen into a coma. Sancho tries to cheer him up ("A Little Gossip"), and Alonso opens his eyes. He is now sane: he gives his name as Alonso Quijano and thinks his knightly career was just a dream. However, he feels close to death, and asks the priest to help him make out his will. Aldonza suddenly forces her way into the room. She has come to visit Quixote because she can no longer bear to be anyone but Dulcinea. When he does not recognize her, she sings a reprise of "Dulcinea" and tries to help him remember the words of "The Impossible Dream." Suddenly, he remembers everything and rises from his bed, calling for his armor and sword so that he may set out again ("Man of La Mancha" – second reprise). But it is too late – in mid-song, he cries out and falls dead. The priest sings "The Psalm" (Psalm 130 in Latin) for the dead. Sancho is distraught at his friend's death. Aldonza tries to comfort him, saying that Alonso Quijano may be dead but Don Quixote lives on. When Sancho addresses her as Aldonza, she replies, "My name is Dulcinea." The Inquisition enters to take Cervantes to his trial, and the prisoners, finding him not guilty, return his manuscript. It is his (as yet) unfinished novel, Don Quixote. As Cervantes and his servant mount the staircase to go to their impending trial, the prisoners, led by the girl who played Dulcinea, sing "The Impossible Dream" in chorus. A Bulgarian adaptation for television (Bulgarian: Човекът от Ла Манча, translit. Chovekat ot La Mancha) was released in 1968 directed by Asen Trayanov and Grisha Ostrovski, starring Kosta Tsonev, Nikola Anastasov, Grigor Vachkov, Konstantin Kotsev, Vasil Mihaylov and Tatyana Lolova. A Bulgarian stage adaptation was realized directed by Grisha Ostrovski. A French adaptation premiered at the Théâtre des Champs-Élysées on December 11, 1968. Belgian singer-songwriter Jacques Brel translated the songs and played the lead (the only time he ever adapted songs written by other writers or appeared in a stage musical). Joan Diener reprised her role as Aldonza (this time singing in French). It was recorded and issued in 1968 as the album L'Homme de la Mancha. Another French version based on Brel's translation was produced in Liège in 1998 and 1999 with José van Dam in the lead role. In March 2012, French baritone David Serero performed the lead of role of Don Quixote in a new production, produced by himself, in Paris and Deauville. A Hebrew-language production was produced by Giora Godik in Tel Aviv, Israel, in 1967. A Japanese-language production entitled The Impossible Dream was produced in Tokyo, Japan, where Matsumoto Kōshirō IX (as Ichikawa Somegorō VI) took the lead role. A Korean production first opened at the Haeorum Theater of the National Theater of Korea in 2005 under the name Don Quixote. Ryu Jung-han and Kim Seong-ki starred as the main characters. In a 2007 production, this time staged under its original name, Cho Seung-woo and Jung Sung-hwa starred as Quixote/Cervantes. They reprised their roles a year later and in 2010. Multiple stars played the titular role in the 2012 production, including Hwang Jung-min (who had to step down due to him directing and starring in a production of Sondheim's Assassins and was replaced by Ryu Jung-han), Seo Bum-suk, and Hong Kwang-ho. The first Spanish production opened in 1966 in Madrid, Spain, starring Nati Mistral as Aldonza and the great Spanish baritone Luis Sagi-Vela as Quixote/Cervantes. A cast album was released by Columbia Records featuring four songs, all except the last sung by Sagi-Vela: "The Impossible Dream", "Dulcinea", "Little Bird", and "What Do You Want From Me". José Sacristán and Paloma San Basilio starred in an acclaimed Madrid revival, El hombre de La Mancha, in 1998. A 2-disc cast album was issued by EMI-Odeón, recorded live at Teatro Lope de Vega. The first German language version was written by Robert Gilbert and started on 4 January 1968 in Vienna with Dietrich Haugk as director. Don Quixote/cervantes was played by Josef Meinrad, Aldonza by Blanche Aubry and Sancho Panza by Fritz Muliar. The production was quite successful and subsequentially shown in other German speaking theaters. A recording with the German cast was published by Polydor within the same year. ^ "A Diary for I, Don Quixote" (PDF). Cervantes (journal of the Cervantes Society of America). 21 (2): 117–123. 2001. ^ "Goodspeed Musicals – Past productions including Goodspeed original productions; Man of La Mancha, Shenandoah, Annie and many more!". www.goodspeed.org. Retrieved May 20, 2017. ^ "Atkinson Rejoins Musical" (PDF). The New York Times. September 8, 1969. ^ Green, Stanley. The World of Musical Comedy (1984), Da Capo Press, ISBN 0-306-80207-4, p. 459. Books.google.com. Retrieved January 7, 2013. ^ a b Mordden, Ethan. Broadway Babies: The People Who Made the American Musical (1988). Oxford University Press US, ISBN 0-19-505425-3, p. 157. Books.google.com. June 23, 1988. Retrieved January 7, 2013. ^ "Man of La Mancha". Stratford Shakespeare Festival. Archived from the original on May 15, 2014. Retrieved May 15, 2014. ^ "Man of La Mancha". Shakespeare Theatre Company. Archived from the original on April 6, 2015. Retrieved April 13, 2015. ^ "Man of La Mancha as TV musical on the Bulgarian national television". Bnt.bg. March 14, 2011. Archived from the original on March 14, 2012. Retrieved January 7, 2013. ^ "Musical Plays on the Hebrew Stage". Mfa.gov.il. July 16, 1998. Retrieved January 7, 2013. ^ a b c "Man of La Mancha cast albums". Castalbums.org. Retrieved January 7, 2013. ^ Poza, JosÉ Alberto Miranda. Anais Do i Congresso Nordestino de Espanhol (date unknown), Editora Universitária UFPE. Books.google.com (in Spanish). p. 52. ISBN 85-7315-504-3. Retrieved January 7, 2013. ^ "Der Mann von La Mancha". March 27, 1994. Retrieved March 27, 2018 – via www.imdb.com. Wikimedia Commons has media related to Man of La Mancha.